Stegmaier’s version of the old style “take home” paper bag from your corner watering hole. Note the products in smaller print are Ale – Porter – Stock Lager. Very unusual to see Stegmaier Stock Lager on post-prohibition advertising. I have 3 different versions of these bags. There may be more. This is Steg’s entry into the Malt Liquor market in 1966. Very little advertising of this product. 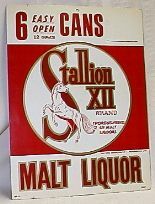 They used the name Gold Medal Brewing Company on their Stallion XII. Suspect it was an unsuccessful attempt to capture the Colt 45 market. This is a 10 1/2 x 14 cardboard sign for the retailer to advertise a 6-pack price. It has a hole for hanging or an easel back for standing. A photograph (probably 50’s) of a Steg delivery trailer. One of those stainless steel trailers with an appearance much like the old diners of the period. The little buggy in the front has an advertisment for a Pennsylvania beer distributor.